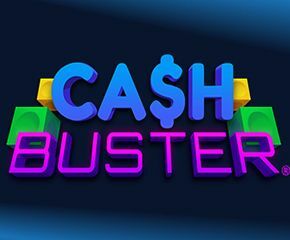 Cash Buster is a creation of Instant Win Gaming. As is evident from the name of its developer, this game provides some instant wins. As such, it is quite a popular name amongst the players of lottery – type games throughout the world. An easy – to – understand gameplay and the instant win prizes keeps the players’ interest alive in it for hours at a stretch. As mentioned earlier, it is developed by IWG or Instant Win Gaming. This company is a leading supplier of online instant win games to the lotteries. They have about ten years of experience in this field and are based out Britain with their head office in the east part of the capital city of London. Once the Cash Buster loads, the first thing, as in the other games, you do is to place the bets. This can be done by using the plus and the minus buttons provided. After that the game begins where you are awarded 8 dice rolls. These rolls are the gateway of making winnings. When you throw a roll, it brings up a coloured face showing to you right on the screen. 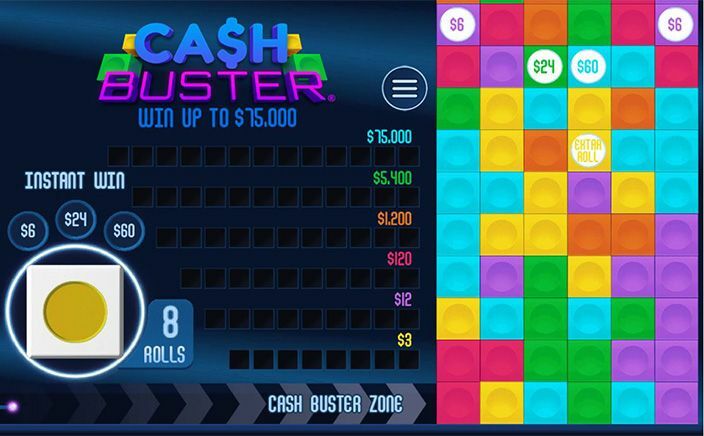 Towards the right of the screen, there is a Cash Buster zone consisting of blocks of different colours. The colour shown after the roll of the dice is matched to the coloured blocks which lead to the destruction of the blocks of the same colour. This leads to filling up of prizes in place of the destroyed blocks. Once you complete an entire row with prizes, you get a payout. You can also get an instant payout by destroying a block with an instant win prize. Remember, you get only eight dice rolls to achieve a complete row full of prizes. You can get an extra roll only if you destroy the corresponding block that provides an extra roll. The game ends when you exhaust all the rolls. Cash Buster might not have a return to player percentage as good as provided by the new slot games. But it has a pretty decent percentage of 85.3 as compared to another lottery – based games of the same type. A stress – free gameplay, a surprise element in the form of an instant win, a colourful setup and brilliant sound effects make it a much-loved one amongst the players of lottery games. The developers at Instant Win Gaming have done full justice and made it a wonderful game.